Born of the union of creo, to create; and reor, to think; Creor means creative thought. Established in 2001, Creor Group is a thoughtful consulting practice, a flexible creative house and a frugal partner in the management of our client&apos;s marketing investments. We use tools and processes developed by Bob Eminian including the Optrian Marketing Method to help our clients find their voice and the Product Passport Process to both guide the story expression by our virtual team and implement integrated campaigns to reach your audience. 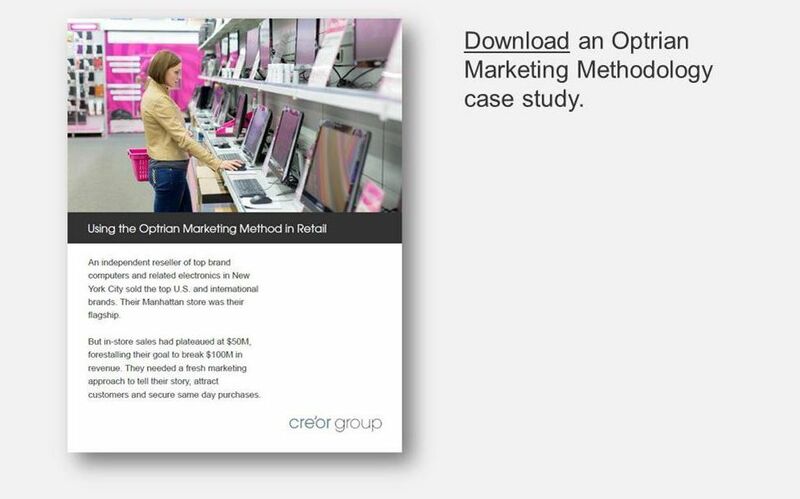 Creor Group developed the Optrian Marketing Methodology in 2001 and it&apos;s still our North Star today. It guides our storytelling, shapes the research and planning we do, and determines how we optimize a client&apos;s marketing budget. Learn more below and contact us for a free consultation. Businesses, whether startups and aspiring small business, or established brands looking for a new breakout product or relaunch, first, fall in love with their solutions and second, presume customers will as well. As a result, many businesses under-invest in marketing during the planning process. They consider marketing a cost that can be cut out rather than an investment to be made. And they misappropriate the dollars that are set aside for marketing. The marketing strategies, whether its product marketing, identifying the right product or service; channel marketing, motivating and equipping a channel to sell; or marketing communications, branding and positioning the product, have to address the premises. This is the first gate addresses the first premise that a buyer goes through on their journey to making a purchase. It’s the classic features/benefits/checklist. If your customer wants a blue-ink pen, and you have a red-ink pen, they aren’t going through that gate. Move on or change your offering. Don’t waste resources pushing a sale that has little chance of happening, and if it does, it likely won’t have much customer satisfaction or return loyalty. For many companies, the Logical Gate is their story, placing 55-70% of their marketing and sales efforts on “what” it is they’re selling. In the Optrian Marketing Method, your go-to-marketing strategy weights the importance of this gate in the 20-25% range of importance to your customer. We make it more effective by not only articulating the features, but also knowing the benefits and why it matters to your customer. The Logical Gate of not only answers “what”, but also answers “so what, who cares”. 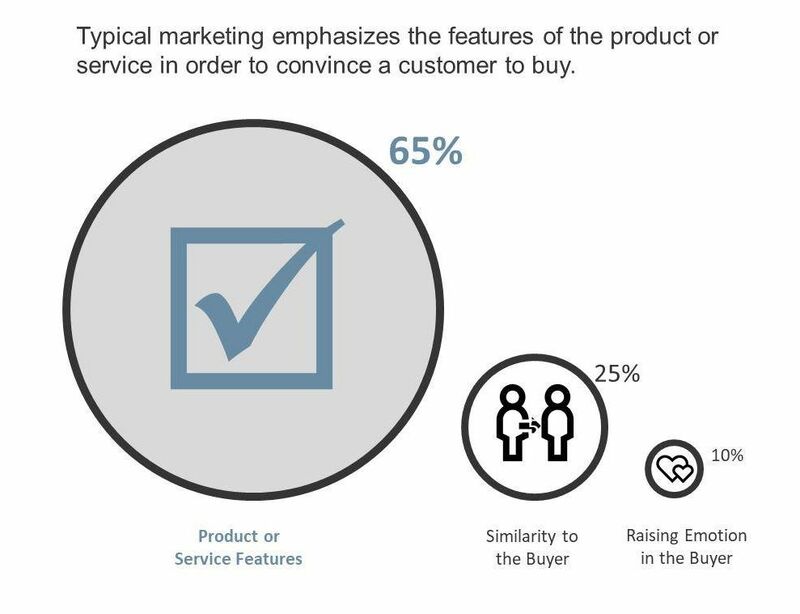 If your customers accepts that you have the right product and agree with the benefits, they pass through the first gate and you’re 20-25% of the way to convincing them to buy from you. Commonly, businesses overlook the Similarity Gate. Some nail it – fashion and automotive for example. Buyers see themselves in that dress or behind that wheel. Those products, and their brands, become extensions of the customer’s psyche. They relate. They are similar. They buy. This Similarity Gate tackles the second premise – people buy from people they perceive to be like them. 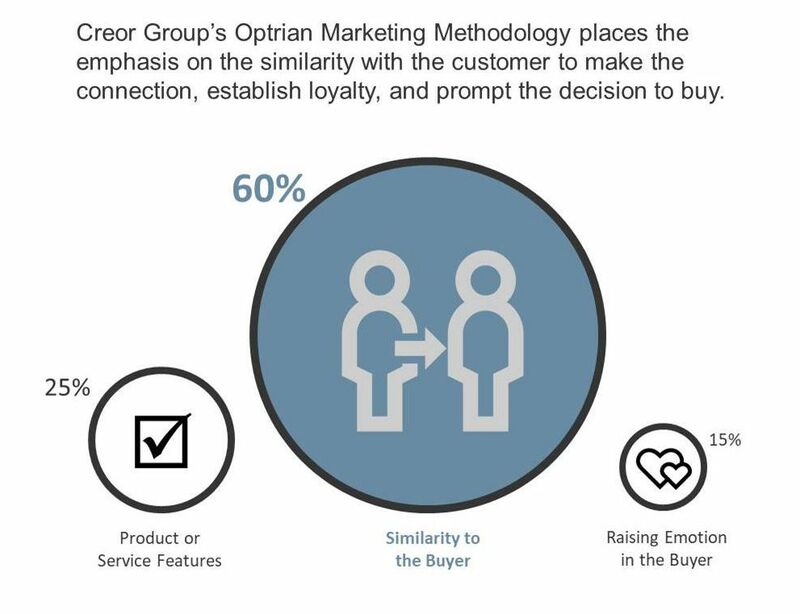 That’s why in the Optrian Marketing Methodology, the Similarity Gate is the big guerilla in the room. We place the decision-making importance to a customer of this gate at 60%-70%. If the Logic Gate affects the product definition, the Similarity Gate affects the buying experience. If you see yourself as a champagne and caviar person, you look for high-brand products and high-touch experiences and buy in luxurious places. So to craft the marketing storytelling for the Similarity Gate, we dive deep to understand the business – what are the resources, abilities, tools, channel, support, identity, branding, etc. available to prompt a successful Similarity Gate decision. It’s exhaustive but immensely fun and satisfying. At the end, your go-to-market strategy has to shape everything for similarity to the customer – the person – to whom you want to sell. Words, images, packaging, how a phone call is answered, a web page, a uniform, a sales person, a color, how an order is taken, how a bill is presented -- everything matters. You may have a killer product or service, but if the channel and marketing doesn’t support the experience your customer expects, you aren’t similar and they won’t pass through that gate. How important is this? The Similarity Gate is 60%-65% of the decision making process. It’s how you connect with the right customers and, especially in commodity markets, how you differentiate from the crowd. So you’re product features and benefits were right on target. Your buying experience and brand really connected with your customer. But you have to get them through the last get, the Emotional Gate, before they’ll buy. People buy on emotion and the stronger the emotion, the more likely they’ll buy today instead of six months from now. The Optrian Marketing Methodology helps us to define the emotional triggers that then get woven into words, images, colors, videos, sales pitches, phone scripts, flyers, brochures, ads, offers, etc. You may need a marketing program that includes developing tools for use at the start of the sales funnel to identify the emotional triggers. Does your customer have an issue on reducing cost. Pressure for supply to complete a shipment. Anxiety about the timing of a delivery. Fear of getting fired. Or conversely, could they be a hero, get a promotion, woo a partner, share their joy and love. What emotion is played up depends on a lot of factors, and can change over time, but weaving it into the strategy and execution is key. 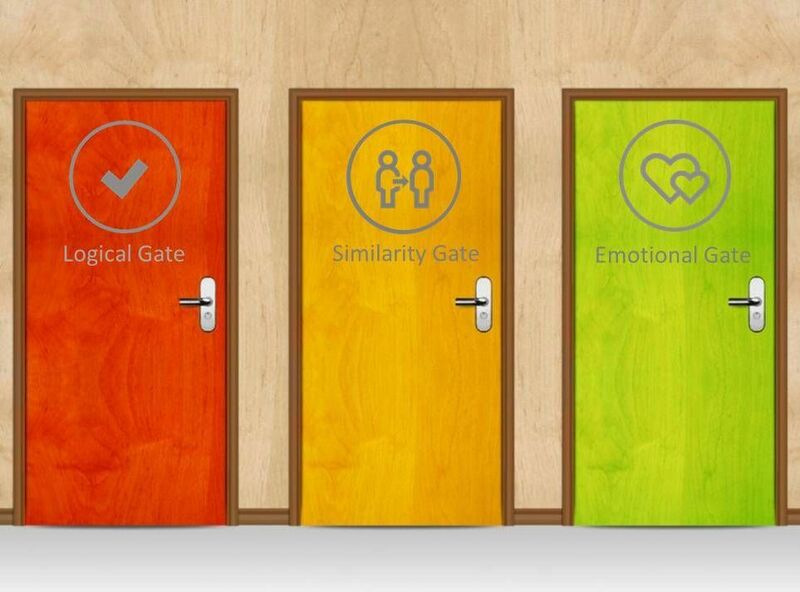 The Emotional Gate is 10%-20% of the buyer’s decision criteria and the last threshold to cross before buying. So to tell your marketing story successfully, whether it’s to launch or reposition your brand, your product or your service, don’t assume they will come if you build it. Use your marketing budget to create a story that takes your customer on a journey through the three decision gates and puts you on the best sellers list. Every story has a structure. In the context of marketing, the method of storytelling shapes the strategies, the implementation, the resource and budget allocations, and the success. Our methodology is called Optrian, which means three decision gates. We believe that a buyer goes through three gates before they decide to buy. If your marketing story doesn&apos;t take them on that journey, you won&apos;t get the sale. Read on the learn more and contact us for a complimentary consultation for your business. Bob is a marketing storyteller. He&apos;s a solutions-focused Senior Executive and Consultant with 35 years of success across the marketing and advertising, technology, and computer hardware industries. Leveraging extensive experience leading branding strategy for companies, he is a valuable advisor for an organization needing help with global marketing. His broad areas of expertise include communications, strategic planning, marketing research, process planning and business analysis. He worked for more than a decade on the client-side of marketing in leadership positions with Samsung, Lunera Lighting, AMD, iZ3D, and Empact Software, launching products that have generated billions of dollars in revenue. In 2001, he founded the marketing and branding agency, Creor Group, where he leads a network of award-winning talent to tell the stories of clients such as Samsung, Lunera, SC Johnson & Company and NEC to name a few. He also co-founded Creor-LED, a full service consulting practice for LED lighting and smart building controls markets; and co-founded CREW Communications, a communications, public relations and social media agency to help B2B and B2C clients. In 2018, in addition to technology, software and consumer products marketing, Bob has been engaging in marketing consulting for the food and beverage industry, including the marketing and branding of restaurants, food products and chef brands. His immersion in high-tech helps food industry clients realize higher brand value with the application of technologies such as hyperscale imaging and blockchain for food supply chain and product quality assurance. Clients find that Bob is their unique bridge between the client-side and agency-side of marketing. With degrees in engineering, business and as a Certified Business Communicator, he can guide a team to craft a story and voice that will resonate with the end customers of our clients. He is doing what he loves -- helping clients, both established and startup, launch products, businesses and brands -- and to tell their story to an audience who cares, in the most approachable way. Our network of individuals and agencies spans the globe with many on the West Coast, including these award-winning partners. Our marketing methodology is the way we discover your voice. Through it we define the three legs to your story -- what are you offering, who you are and why does your customer care. on the same page as we implement your story and get it in front of your customers. At times you need a chapter. At other times you need a tome. Whatever we are creating, the virtual nature of our organization enables you to have optimal resources at the right time. It let&apos;s us be your marketing concierge service. We also are flexible in how we interact with you. We can be your turn-key, in-sourced marketing department with an interim CMO, a project team or gap-fillers when you need resources and consulting not available from your in-house or agency teams. Engagements can be hourly, by project, under retainer or in any combination. We&apos;re a hybrid of consulting and agency resources organized as a virtual team. By using a process to knit our network of talent together, you receive a seamless experience that optimizes your marketing investment. Your team has just what you need, when you need it without the overhead to pay for resources you are not using. Our agency and individual contractors are principally on the West Coast, but also across the country and around the globe. For global and international clients, our team&apos;s diversity enables us to be culturally adaptive as well as sensitive to the differences a headquarters, regional branch or local office might require.